That's both good and bad news. Good because we had no way to test if the system works as expected--automatically starting the generator when the battery bank voltage stays below a threshold voltage for some period of time. See this post for the details. Bad, because that means we've gone a while without a full charge on the batteries. For you engineers reading this, I acknowledge that amps is not a measurement of power or energy storage. That would be watts. But, I argue that if we assume an average battery voltage of 24.5 amps, then Ah becomes a decent surrogate "gas gauge" for the battery bank capacity and usage. Amp-Hours is also useful for a couple of other reasons. Battery capacity is specified in Amp-Hours, so there is a direct correlation there. My battery bank has a capacity of about 1100 Ah. So, if the meter reads -250 Ah, I know I've used about 1/4 of the total capacity. And, I never really want to use more than about 1/2 of the capacity in order to keep the batteries in good condition. Anyway, back to the main topic. We had not achieved a full charge on the battery bank in many days. This is due to several mostly cloudy days in a row. We'd recover some each day, but not enough to compensate for our daily usage and make up for previous days' deficits. 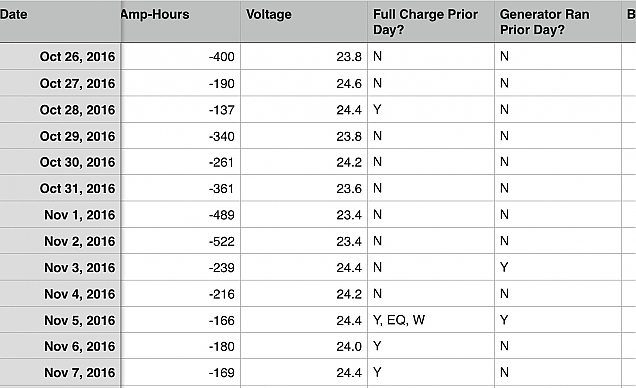 The table above shows the battery capacity readings first thing in the morning for several days. On November 2, we were down more than 500 Ah, the battery voltage was below 23.4 volts, and after 2 hours, the generator kicked on. It ran until the batteries were fully charged, about 3 hours or so. The sun also came out brightly helping with the charge. Equalizing is an overcharge performed on flooded lead acid batteries after they have been fully charged. It reverses the buildup of negative chemical effects like stratification, a condition where acid concentration is greater at the bottom of the battery than at the top. Equalizing also helps to remove sulfate crystals that might have built up on the plates. If left unchecked, this condition, called sulfation, will reduce the overall capacity of the battery. I also added distilled water on that day as equalization can boil off some of the water in the batteries. Previous entry: What Does a Bear do in the Woods?